Do you want to hire employees who can contribute to your success and profitability while adding value to your culture and team? There are many things to consider when you're looking to fill a position. But just how do you weigh the most important factors in a process that can seem to take a long time? Employers can shorten their recruitment cycle, find great employees, and legally and ethically hire people if they follow these ten steps. The first step in any hiring process is to determine whether the position is, in fact, needed in your company. There are a few ways to help you decide. If this is for a sales position, cross-check sales per employee. You may also look at whether the team's workload merits a new hire. Your business goals will also drive this decision. Your priority for an employee should also fit into the successful execution of the company’s business plan. It’s important to keep your other employees informed or involved at each step of the staffing decision process. The second step in the hiring process is to plan your employee recruitment. Recruitment planning identifies the job description or specification for the position so you know the skills and experience you seek. It also addresses how to publicize the position, who will review applications, and who will participate in first and second interviews. You should also decide who will participate in selecting the successful candidate and who will provide input. This is a key step in a successful hiring process. It’s also important for anyone on the interview team. You need to be clear about how their input will be used by the hiring manager and human resources. An important step in the posting process is to notify current employees of the opening. If you believe you have no qualified internal candidates, you may also post the position externally as well. But your internal applicants may surprise you with their talent and skills. If you do post the position externally before interviewing internal candidates, let the employees know. You want to avoid misunderstandings. Your best bets for filling your open position externally depends on the position. Some local jobs — especially for non-exempt roles — rely on local newspaper classifieds. Most jobs will require online postings on your own website and on job boards as well as through social media sites. Notifying your network on LinkedIn can bring quality candidates to your attention. So will asking your current employees to publicize your opening on their social networks. If you have advertised the position effectively, you will have collected a large pool of applicants. HR can take the lead on résumé and cover letter review, and give the qualified applicants to the hiring manager. Some hiring managers may want to see all of the applications — especially for technical, scientific, engineering and development positions. The applications are reviewed and the most qualified applicants receive a phone interview. The purpose of the screening is to save staff time and energy by eliminating candidates. The screener, the hiring manager or HR staff is looking for both cultural fit and job fit during a telephone interview. They check out any questions the reviewers have about the individual’s experience or credentials. Your review and phone interviews should narrow down the field of candidates to the most qualified. Schedule interviews for candidates with the same group of employees who will interview all of the candidates. This will allow comparisons when you arrive at employee selection. Make sure that part of your interview process is a formal employment application filled out by the candidate that includes permission to check references, background and so forth. Notify the applicants you are not inviting for an interview they will not be considered and why. Plan and schedule second interviews with the most qualified prospects as determined by the first interview. 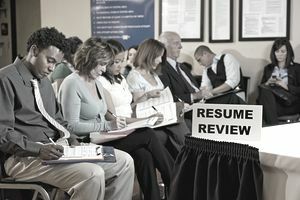 You may begin to check references and background for these candidates during and following your second interviews. Begin to check references and background for the candidates during and following your second interviews. Make sure you check all claims by the candidate including educational credentials, employment history and criminal background. When possible, the best source of information is the applicant’s past managers. Because of the fear of litigation, many employers will share only the job title, dates of employment and occasionally, the person’s salary with you. That’s why managers are a significant source. You should also take a look at the candidate’s public social media profiles and postings to make sure you’re hiring the person you’ve gotten to know. LinkedIn recommendations may further solidify your choice. If you have reached a positive decision on a candidate, following the interviews and background checks, determine the compensation you will offer the selected candidate. These are the seven most critical factors to make sure you’ve considered before you make the actual job offer. Now that you’ve accomplished the first eight steps, you may make a written job offer. If reference checks are incomplete, you may make the offer contingent on the background and reference checks. You also need to notify the other candidates who participated in job interviews. It’s important — and in your best public relations image and interests — to communicate with your applicants at every step in your hiring process. It is one of the factors that affect your consideration as an employer of choice. The higher the level of the job in your organization, the more likely the candidate will negotiate compensation, paid time off, guaranteed severance pay if the relationship fails to work out, company equipment, time working remotely and more. These individuals have the most potential to lose if they are leaving a current job and the employment relationship doesn’t work out with you. That said, I have had new employees fresh out of college, ask for $5,000 more than what they were offered. If it was within the salary range for the job (think about how you pay your current employees in similar roles) and the candidate is preferred, consider negotiating. The two most common requests I’ve encountered are for a higher starting salary and more paid time off. Flexibility is required. You won’t have a happy new employee if he left a job where he had three weeks paid vacation for a job that offered him one week. Determine if you can accommodate other requests by your prospect. The most common I’ve encountered has been a vacation scheduled within the first few months of starting. I’ve also encountered several postponed starting dates to accommodate scheduled surgery. How you welcome your new employee lays the groundwork for whether you will retain the employee in the future. Stay in touch with your new employee from the time she accepts the job offer until her start date. Continue to build the relationship. Assign a mentor, let coworkers know the employee is starting with a welcome letter, plan the new employee’s onboarding process and make sure the employee will feel warmly welcomed during the first days of work. If you do this effectively, you will have an eager employee who is ready to set the world on fire. Are you interested in a more detailed hiring checklist? Take a look at A Checklist for Success in Hiring Employees. What Communications Do Employers Owe Job Candidates?